EU banks have borrowed less than expected from the European Central Bank, easing concerns about liquidity among financial institutions.After Tuesday’s sharp falls, stock markets and the euro stabilised on news that the ECB had agreed three-month loans worth 131.9bn euros (£108bn). This compared with the 150bn to 200bn euros many had expected. The euro rose almost a cent against the pound, while European stock markets also made gains. Eleven years after the introduction of the euro every second German still longs for the return of the Deutsche mark, according to a new poll published on Tuesday. Some 51 percent of those surveyed by market research institute Ipsos admitted they wanted their old currency back. Just 30 percent said that they rejected the idea, while another 18 percent were undecided, the Hamburg-based institute reported. As I have written before, the Euro may or may not be the final world reserve currency. And despite concerns about Greece and Germany (to name only two), there was always expected to be problems with European unity according biblical prophecy (e.g. Daniel 2:41-42). US President Barack Obama warned against fast and deep budget cuts, fearing damage to global growth. As I have written before, for the Europeans to be considered the economic replacement for the USA, their finances do not have to be perfect, they only need to be perceived as being in better shape than the USA’s. And they seem to be taking steps for this to happen. Do not be surprised if the EU’s President, Herman von Rompuy, does not propose and implement some type of tax increase (cf. Daniel 11:20). This would also probably reduce the EU’s debt faster than any debt reductions in the USA. This does not mean that there will not be economic or other problems in Europe. It just seems that the Europeans are more determined to come out on top in the long run than the Americans do. And that is consistent with biblical prophecy. The swine flu, or H1N1, virus has been hiding out in pigs for more than a year, getting a genetic makeover, scientists have discovered. Pigs in a Hong Kong slaughterhouse are carrying influenza viruses containing gene segments belonging to the deadly H1N1 strain that swept the globe in 2009, tests reveal. The discovery is still disturbing, because it suggests the 2009 H1N1 virus could be reshaping its genetic code in animal hosts in other parts of the world. While I am not yet convinced that the “swine flu” will yet be as bad as the worst case scenarios that the mainstream media sometimes have hyped (and so wrote that also in May 2009, see Swine Flu Infects Pigs in Canada), the fact that it may become an issue again did catch my attention. But relatively soon, serious pestilences are prophesied as we are prophetically at/near the point Jesus called “the beginning of sorrows”–which includes pestilences (Matthew 24:7-8). If humans quit eating pigs, the “swine flu” problem would probably go away. But since many still do, it is possible that something may happen with this. 2009 may have been a warning. Posted in Prophecy | Comments Off on Swine Flu Hiding in Pigs: Another Outbreak? VATICAN CITY, JUNE 28, 2010 (Zenit.org).- Benedict XVI says that dialogue between Catholics and Orthodox is at a “crucial point” and invited heartfelt prayer to the Holy Spirit for progress to continue. Patriarch Bartholomew I has already gone on record to support unity with the Vatican (Bartholomew I Patriarch of Constantinople Opposes Those Who Warn Against Catholic Unity). Most of the Eastern Orthodox that I have spoken with do not trust the Patriarch’s unification plans. The reason for bringing this up is that when I visited the offices of the Ecumenical Patriarch of Constantinople, I was told by a Greek Orthodox Southern Californian who was assigned then assigned to Contantinople that one of the Pope’s representatives told Patriarch Bartholomew that if he would accept the Vatican’s authority, that the Vatican would compromise and accept all the doctrinal differences that the Eastern Orthodox have from the Church of Rome. Thus, compromise from both sides is expected. Since both sides claim to be faithful to the original faith, how could either compromise? One may wonder how this news has prophetic ramifications. There are several. But mainly, both biblical, Catholic, and Eastern Orthodox prophecies tell of a time when the Catholics of Rome and Constantinople will be unified. While the biblical prophecies and some of the Catholic and Eastern Orthodox prophecies seem to warn against this, there are other Catholic and Eastern Orthodox prophecies that seem to look forward to this. Both Pope Benedict XVI and Patriarch Bartholomew I seem to be looking at the “prophecies” that encourage this, while not realizing how dangerous this will be for their churches and the entire world. And they keep taking steps to accomplish this, despite the real dangers to the world. These unification talks are one of the subjects that prophecy followers should “watch” (cf. Matthew 24:15; Luke 21:20). The U.S. Air Force said that a report released by the U.S. Government Accountability Office (GAO), which claimed that the U.S. military GPS system is experiencing serious degradation, is not accurate, according to a May 25 statement by Air Force Col. Dave Buckman. “The issue is under control,” said Buckman in an online press conference. (Air Force Official Disputes GAO Report on Projected GPS Failure. Satellite Today, May 26, 2009. http://www.viasatellite.com/military/headlines/Air-Force-Official-Disputes-GAO-Report-on-Projected-GPS-Failure_31100.html). I disagreed with the Air Force’s public assessment then, and disagree that now relying on the satellites of powers like the European Union is in the USA’s best interest. I maintain that it will lead to the USA being successfully attacked and even taken over as that is consistent with biblical, Catholic, and other prophecies. …Faced with mounting GPS program costs and escalating demands to transfer dollars from Pentagon space accounts to other U.S. defense programs, Air Force officials have been quietly considering postponing some GPS satellite launches, according to people familiar with the details.The new policy, one Obama administration official said over the weekend, allows foreign navigation satellites “to augment but not replace” GPS capabilities. The Obama Administration can call it “global cooperation” but the USA is not now truly going to trust Russia for any serious military capabilities (other than perhaps certain launches, etc. )–but the EU is another story. Yet, Europe’s Galileo satellite system initially had US critics as there were “early objections from the Americans who thought a rival system to GPS might be used to attack its armed forces” (Amos J. EU awards Galileo satellite-navigation contracts. BBC, Jan 7, 2010. http://news.bbc.co.uk/2/hi/science/nature/8442090.stm). Certain officials remembered that the USA fought two major world wars against European powers and considered that a Europe with its own military satellite capabilities was an important threat. What changed? The economy amongst other things, and international pressures from rising powers such as China. More and more world events are aligning with the biblically-backed predictions in the book 2012 and the Rise of the Secret Sect. More events will also align with what it says. Events that will affect you and your loved ones. While some may say that the Europeans do not want to take over the USA, Bible prophecies suggest it will happen anyway (Isaiah 10). Aspects of 2012, y2k, and other false pronouncements of the end (including from “prophets” who claim to be Christian) will turn people off to the truth of biblical prophecy (cf. 2 Peter 2:1-2; 3:3-13). But they will come to pass. Most will be ignorant of what really will and will not be happening. But you do not have to be. If you have not already done so, please get my book 2012 and the Rise of the Secret Sect. Compare what it teaches with the Bible. Compare what it teaches with what is happening in the world. World events have already aligned with at least 11 predictions that the book documents. World events are aligning with what it shows need to come to pass. If you have any interest in end time events, you really need to read 2012 and the Rise of the Secret Sect. WASHINGTON (AFP) – Iran has enough low-enriched uranium to make two weapons, which it could have prepared and ready for delivery as early as 2012, CIA director Leon Panetta warned Sunday. “We think they have enough low-enriched uranium for two weapons,” Panetta told the ABC network’s “This Week” program. Israel seems to have plans to stop Iran from being nuclear before 2012–though negotiations could affect them. Since Iran is NOT going to be the leader of the final King of the South, something is likely to happen (an attack from Israel/USA and/or civil unrest/revolution are two possibilities) to stop Iran from getting enough power to lead the final Islamic confederation. But since Iran’s goal is to cause enough conflict to cause the fulfillment one or more Shi’ite prophecies (see Forbes: Iran Preparing for War and the Mahdi), it is likely to be in the news for a while. The above scripture does NOT say that ten existing nations will be the group that gives their power to the Beast, but ten kings who had not kingdom get power and transfer it. This, as I have written before (see Herman von Rompuy, the Greek Debt Crisis, and Where May this Lead? ), means that a political/structural shift is expected to happen in Europe. Hence while nations will be involved, this is more likely groups of nations, combinations of nations, or redrawn territorial borders. To teach that this means that there must be 10 nations as they currently exist is in error. The PCG is the only Church that holds onto ALL of what Christ established through Mr. Armstrong (Flurry, Gerald and Leap, Dennis. Ezra and Nehemiah: Building God’s Temple. Booklet. 1997. p.29). PCG should not keep teaching nor implying that the scripture is speaking of ten existing nations unless they also add an expression indicating groups of nations or some other qualifier. The European Union currently has 27 member nations, with several additional nations likely to join. As a result of the Lisbon Treaty (European empire formed yesterday, but few in America seemed to notice), all the nations in the EU are obligated to adopt the Euro once their economies are ready for it. So, the Lisbon Treaty would need to be modified if this is to be changed (it would take 15 of the 27 European nations representing at least 65% of the population of the European Union to make such a change law). And though the Bible supports the idea of some type of consolidation, it is highly unlikely that most of the countries now in the EU will not become part of the final Beast power. This is not to say that some may not possibly leave, but to continually teach that it will be whittled down to ten currently existing nations is going beyond what scripture teaches. PCG’s Gerald Flurry is a self-appointed prophet. And if this position that the European power must be reduced to ten current nations is one of his “prophecies”, this will be another area that he will be shown to be a false prophet. Russia has voted for tougher U.N. sanctions on Iran and has frozen a deal to send anti-aircraft missiles to that country. The conventional wisdom is that Russia’s economic interests in Iran have led Moscow to be a strong supporter of that country, opposing any tough United Nations sanctions against Tehran over its alleged nuclear weapons program. 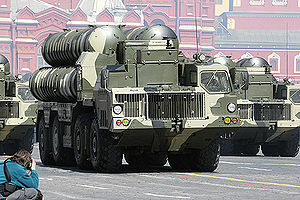 By not providing Iran the S-300 anti-aircraft missile system, Israel has a little less pressure to hurry up and attack Iranian nuclear facilities (which are probably do spread out that all would not be destroyed). But because of Iran’s nuclear program, it may decide to hurry anyway. Although Russia’s move should send a signal to Iran, since Iran’s leadership is focused on getting an Islamic leader known as the final Mahdi or thirteenth Imam to rise up, it may not change anything because of Russia’s decisions. While Bible prophecy suggests that Russia and Iran will eventually cooperate (Ezekiel 38:1-6), that is for a time well past the Great Tribulation. Right now with Iran determined to get the final Mahdi to rise up (see also Forbes: Iran Preparing for War and the Mahdi), it seems determined to proceed with its plans no matter what any other country, including Russia, wants. VATICAN CITY, JUNE 25, 2010 (Zenit.org).- After more than 10 years as the point man for the Church’s efforts to promote Christian unity, Cardinal Walter Kasper today announced his resignation as president of the pontifical council dedicated to that cause. The 77-year-old German cardinal acknowledged mixed feelings about leaving the post. Cardinal Kasper’s successor has not yet been announced…And the prelate was positive about the future of efforts to build Christian unity. Walter Kasper is likely to be replaced by one who may become the next pope, or at least will help fulfill prophecies related to a world-dominating religion. His successor will be one to watch. One French bishop (but not a cardinal) that is ecumenical is Marc Stenger, Bishop of Troyes (but it could be someone else, including a non-Frenchman). Both biblical and Catholic prophecy suggests that a pope will come who will compromise greatly and unify many–Catholic prophecy suggests he will possibly be a properly-elected antipope. Such a pontiff will likely be one who is believed to be ecumenical for the sake of Catholicism, but will more likely actually be ecumenical for the sake of political power. Prophecy watchers need to take such warnings seriously. Walter Kasper’s announcement is setting the stage for one or more to rise up. Catholic Prophecies: Do They Mirror, Highlight, or Contradict Biblical Prophecies? People of all faiths may be surprised to see what various Roman and Orthodox Catholic prophets have been predicting as many of their predictions will be looked to in the 21st century. And some will come to pass (though not quite as many believe). Posted in Prophecy, Religious News | Comments Off on Cardinal Walter Kasper to Retire: Watch Out for His Successor! Though Europe has problems, and likely will have a lot more, the reality is that once the world realizes that the USA has gone over the top on debt, all Europe has to be is to be perceived as less debt-minded than the USA. While the USA President believes that the public-spending policies will lead to economic growth in the USA, the reality is that the Bible is clear that high debt will lead to destruction at the appointed time of the end (Habakkuk 2:3,6-8). And while European leaders may also not understand this part of the Bible, they do understand that debt is highly destructive. This does not mean that there will not be troubles/riots/civil unrest in Europe. But the reality is that for many reasons, the Europeans will take a little more cautious approach to increasing debt than the USA. And that will ultimately mean trouble for the USA. Without going into the details, like many Protestants, J. Tkach uses the “just as you are” line when discussing theological matters. While repentance is a biblical term, the expressions “just as you are” or “come as you are” are not found in the Bible. While the Tkach organization can teach what it wishes, those who truly believe that doctrine should come from the Bible realize that “just as you are” is not really the message of the Bible. While it is true that God calls people who are sinners, He does not expect that they will stay that way. The operative word in the above is WERE. They were not to remain in their sins. Thus, while God will call people who have a variety of sins (and all but one can be forgiven–see What is the Unpardonable Sin? ), the Bible is clear that God does not want His people to remain “just as you are”. So, repentance, growing in grace, and growing in knowledge is what God wants. He may call you from anywhere, but really does not want you to remain “just as you are”. You are currently browsing the Church of God News weblog archives for June, 2010.